Many people in the world possess detailed, specialist information about one particular topic. Only a tiny few have total, encyclopedic knowledge about an entire field. And even those who do may have little interest in sharing that with others. The brilliance of the wiki idea is that it permits a group of people to pool their knowledge. A surprisingly comprehensive resource can grow in an “ant-hill” fashion, based on many small individual contributions. The predecessor to camera-wiki.org was Camerapedia (its remnant now sadly assimilated by the Borg). By the time I became aware of that site, it already offered several thousand articles—and I enthusiastically began donating images of the gear I personally owned. But at that time, I guess I assumed there must be a giant, organized team of people working behind the scenes, to create such a wide-ranging resource. In fact, a wiki such as ours is mostly built by a handful of people. It’s just that when you take a half-dozen people, each contributing three or four new pages a week… Add that up, and you start growing at a pretty impressive clip. I’m proud to say camera-wiki.org has added 1,267 article pages in the 14 months since our fork began. The original Camerapedia may never have gained momentum if not for one super-contributor, Rebollo_fr. He is fluent in English, Japanese, and French; and happily shared crucial information dug up from crumbling old Japanese magazines. Furthermore he became Camerapedia’s most active admin and organizer. The most meticulously-researched pages you still find in camera-wiki.org, covering oddball Japanese brands, are all due to him. 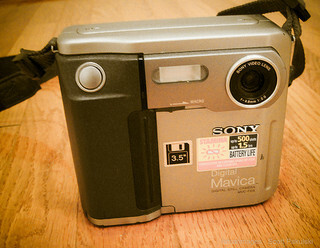 Floppy-disk Sony Mavica: From the sublime to the ridiculous, wiki contributors cover it all. CC image by Scott Pakulski. Today we’ve got a new crowd of contributors, each following their own particular camera interests and adding information to the wiki. As you can tell from recent blog posts here, Steevithak is trying to track down every scrap of information about Vivitar (Ponder & Best), and other lens distributors. Tkmedia has worked tirelessly to add coverage of instant photography, light meters, and film/paper manufacturers—building frameworks which enable others to add their own details. Dustin McAmera (best login name ever) has contributed many articles on less-known British camera manufacturers. He’s done great research using camera-auction sites, so we can link to camera images unobtainable anywhere on Flickr. Morinaka has been straightening out the confusing King Regula camera series. New contributor DesmondW has been adding to our Leica R-system and Gossen meter pages. I’ve made some quirky additions myself: Most recently, proto-digital oddities like Sony’s floppy-disk Mavicas, and the even more paleolithic still-video cameras of the mid-1980s. Of course we also need to give a shout out to the nearly 1000 members of our Flickr group, who collectively have added some 46,250 wonderful images. If you check our image-by category list, you’ll see some photographers have provided images for dozens of wiki pages. What I want to emphasize here is that you don’t need to be an encyclopedia yourself, to write for an encyclopedia! Whatever highly-specific area of camera-collecting or photography interests you, adding your knowledge to our wiki helps everyone. This entry was posted in About Camera-wiki.org and tagged camera-wiki.org, camerapedia, contributions, crowdsourcing, growth, wiki. Bookmark the permalink. I’d contribute more if it wasn’t already so comprehensive! Seriously, every time I buy a “new” camera I check Camera-Wiki to see if I can add anything. Nine times out of ten, there’s nothing missing! Clearly, I need to start buying more obscure cameras. Great job on the fork, and thanks for keeping Camera-Wiki an open and community-maintained site. All the best for the future – here’s to the next thousand new pages. That’s a great point. When an article is marked “Stub,” it often means the information used to write it came just from spec sheets or a review somewhere. Firsthand information can add a lot to that. What feature is the coolest, or most ridiculous?